But that’s not the best reason to come. In Quito and Cuenca, high temperatures average a comfortable 75 F year-round, and that means we can wear short-sleeved shirts almost every day…but we’re never roasting hot. The air is dry, and we aren’t badgered by mosquitoes. At night, the temperature is an agreeable 50 F or 55 F, so you can build a fire for ambiance…but you rarely need it for warmth. On the coast, the weather is warmer, of course, but not as hot and humid as a Florida beach during the summer. Surrounded by volcanic peaks that reach heights of almost 21,000 feet, we can sit on our front patio each morning in the clear mountain air, sip coffee, and bask in the equatorial sun. Yet we’re not isolated. Ecuador offers easy, affordable access to the rest of South America. From Ecuador it’s easy to explore the splendors of Peru, Argentina, and Venezuela. Inside this tiny nation, barely larger than the state of Nevada, at least 14 different ethnic groups live side by side, some still speaking the language of the Incas. Fine craftsmen and attentive caretakers of their land, Ecuadorians adhere to the natural healing traditions their ancestors taught. And whether they live in jungle river towns or coastal fishing villages…colonial cities or isolated cattle ranches…they are a friendly and polite people, which makes day-to-day living here a pleasure. Ecuador is gentle…safe…healthy…private…civil. As one friend of ours put it: “It’s like living in the 1950s in the USA.” You’re guaranteed a quality of life that just plain doesn’t exist anymore in the States. Up north, violence, materialism, and increasingly intrusive government policies have whittled away the last vestiges of the American Dream. Yet here you’re guaranteed a truly extraordinary lifestyle. And that makes Ecuador the perfect place to retire…to reinvent yourself. You’ll find like-minded company when you do. This is a place where you can reconnect with the Earth and discover the natural rhythms of the world. For millions of years, Mother Nature has provided natural remedies to soothe our pains, calm our anxieties, and protect us against illness. But in the last century, synthetic medicines have supplanted these natural remedies in popularity and accessibility…except in a few small, protected pockets of the world. Ecuador is one of those places. You eat organic fruits and vegetables…because that’s what’s sold in the markets. You walk more…because the pace of life is slower and you take the time to do it. The hours you once wasted in commuter traffic you now spend in the relaxing company of friends. No longer do you while away entire days under fluorescent office lights in a climate-controlled building…now you’re outside in the sun. Living here is energizing…restorative. Simply put: You feel younger, years younger, every day. An important fact about Ecuador is that although it is a much poorer country than the U.S., life expectancy here is the same. The reason? Good food and good living. For us, moving to Ecuador was as much, maybe more, about adventure and a better quality of life as it was about value investing or affordable living. But the good news is that Ecuador delivers on all counts. You can find cheap property all over the planet…Ecuador is no exception. But in many locales, you’d lead an uncomfortable life, far from friends and family and disconnected from the rest of the world. Not so in Ecuador. In this country, you can golf on breathtaking courses so free of crowds you never have to make a tee time. A gourmet meal in a world-class restaurant costs about what you’d pay for bottled water and an appetizer in Los Angeles, New York City, or London. The fresh fruits and vegetables you find overpriced at specialty shops up north sell here at the local markets for pennies. Daily flights depart for destinations across the hemisphere. Cell phones seem to be standard issue. Cyber cafes are easy to find, and home-computer hookups are common. Cable TV gets you the major U.S. networks, CNN, three HBO channels, Cinemax, TLC, and more (for less than $50 a month). Ecuador is a safe place to live and invest.We can’t say crime is unheard of. Petty theft, particularly in the big cities, is an issue…as it is in all big cities. But a bolstered police force and greater attention to education have been brought to bear on the problem. Based on statistics compiled by Interpol and the United Nations, Ecuador ranks third safest in terms of serious crime among Latin American countries. Politically, Ecuador is a peaceful country. The population is gentle. Even in the throes of a violent economic upheaval when the local currency careened downward, losing 67% of its value against the dollar in 1999, protests were peaceful. Nobody fired a single shot. Historically, Ecuador has avoided the guerilla warfare and repressive dictatorships that other Latin American countries have endured. And economically speaking, Ecuador is walking smartly on the road to recovery. Back in 1999, the footing was less certain. The country had suffered everything short of the plague: a drought…then rains that washed away much of the country’s infrastructure and crops…plummeting oil prices…near triple-digit inflation…failed banks…frozen assets…the collapse of Asian and Brazilian economies, which further hurt trade…and political deadlock, which made effective government reforms impossible. 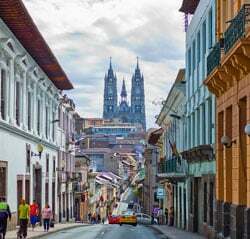 Ecuador’s colonial capital provides cosmopolitan living that is hard to beat. Excellent restaurants, easy-to-use public transportation, first-rate hospitals, and most of the other conveniences you’re used to back home. Brand-new condos (one- to three-bedroom) can go for as low as $74,000, and rentals can start at around $350 per month. For life in the sun (and excellent crafts shopping), a hacienda in the “Swiss Alps” of Ecuador, Otavalo is home to one of the largest indigenous markets in South America. The scenery, with its craggy peaks and mountain lakes, is Swiss Alps quality. The town is tidy, and the Otavalan Indians are among Ecuador’s most business savvy and prosperous, making and selling some of the finest textiles, woolen items, and handicrafts. A United Nations World Heritage Trust Site, Cuenca is another city worth a close look. More charming than Quito, the city was voted one of Latin America’s “most livable” cities by international urban planners in 2006. Considered the cultural heart of Ecuador, Cuenca nurtures a thriving intellectual and artistic community. With a population of 450,000, Cuenca offers big city infrastructure without big city problems. Since 2004, Cuenca has probably attracted more IL readers than any other single destination in Ecuador. Real estate prices in Cuenca are similar to those in Quito. Many expats are buying new condos just of outside the city’s historic district, paying between $50 to $55 per square foot. Many of the apartments have outside terraces that offer stunning views of the city and the mountains beyond. What does it cost to buy here? Less than you might think. A house near the center of the town might cost you as little as $100,000. Or, if you want build your own dream home, you can find a suitable lot for just over $40,000. Ecuador’s coast is magnificent, offering miles of rugged cliffs, beautiful sandy beaches, sleepy fishing villages, and thriving metropolitan areas. If you want nightlife, you can have it. If you’re looking for a quiet retreat, you can have that, too. Check out such cities and towns as Salinas, Manta, Puerto Lopez, Canoa, and Atacames for a range of environments and lifestyle choices. In all locations, you’ll find lots beginning at $40,000 and houses and condos for $65,000. If you’d prefer big-city infrastructure but you still want to be on the water, consider Manta, a major seaport that has become a port of call for Pacific cruise ships. If you’re looking for seaside tranquility, consider Olon and Canoa, places where Jimmy Buffett would feel at home. Clearly, we think Ecuador is worth your attention. But we should, perhaps, qualify our enthusiasm in one small way. If you’re overly bothered by roads that have potholes…if you cannot bear to be in the sight of people less affluent than yourself…if you are at a loss when things do not function in exactly the way you’re used to them functioning…well, then, Ecuador may not be for you. The people we know who seem the happiest here–and certainly the ones who are the most successful in their businesses–they are all adventuresome sorts. They take the unexpected in stride. They set out to explore the unknown. And they are thoughtful; interested in their local communities. Some have begun studying the healing practices of rainforest tribes. Others are working with local craftsmen to help them develop products they can sell to a wider clientele. Still others volunteer in local schools or with environmental groups. Ecuadorians are tremendously welcoming and friendly. And if you launch a new life here with enthusiasm for them and their nation, you’ll find it’s an easy, enjoyable, rewarding place to live. What’s more, your timing is good. Now is a smart time to gain a foothold in Ecuador…before the rest of the world catches on to what a wonderful place it is. Like Costa Rica and Mexico before it, Ecuador will attract a growing number of foreign retirees. And like the folks who invested early in those other countries (and have watched their properties appreciate in value as much as 10 times in the past decade), an investment in Ecuador now could leave you well positioned to profit in the years to come. Baby boomers are approaching retirement at a time when the U.S. economy is sluggish, the bear market has pummeled their investment portfolios, and retirement pensions are no longer a sure thing. They will likely face greater financial pressures in retirement than their parents did. And in greater numbers than ever, they’ll seek out alternatives to merely scraping by in the U.S.
Ecuador will make…already makes…an ideal escape from America.